Like a singer who’s an equally talented musician, Oliver Jeffers is the double threat of children’s literature: an artist who can write. And he does both brilliantly. Jeffers is the creator of “The Incredible Book Eating Boy,” as well as five others that have become cult favorites among children’s book enthusiasts. But this book, more so than the rest, showcases his artistic talents and original voice. A figurative painter and installation artist, Jeffers’ work has been exhibited throughout the world and in commercial projects for the likes of Starbucks, United Airlines, Sony PSP, RCA Records and Newsweek. Owning a copy of the “The Incredible Book Eating Boy” is truly like owning a piece of his art. 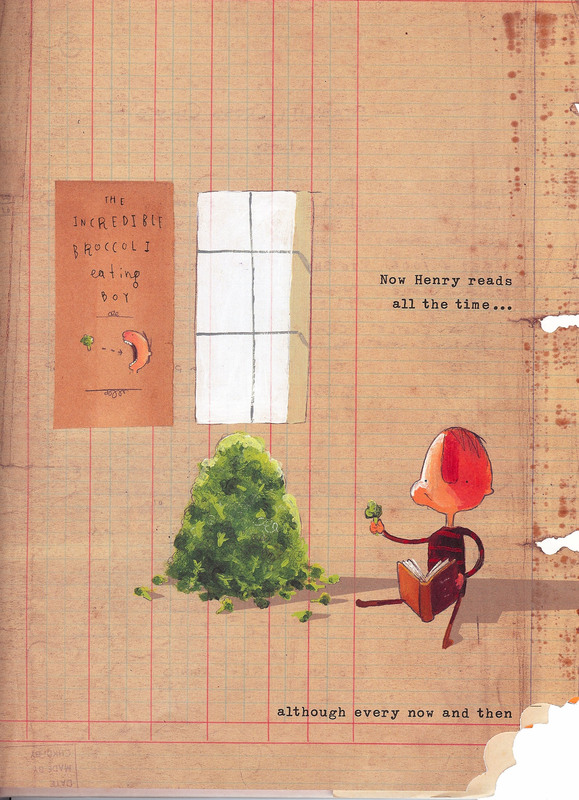 The book tells the tale of Henry, a boy with a voracious appetite for books. Not only does he find them delicious, but he also discovers that the more books he eats, the smarter he gets. That is until he starts eating books three and four at a time; then his brain becomes a jumbled mess and his stomach is a wreck to boot. The storyline is simple, but the illustrations are captivatingly multifaceted. Every picture is built upon the remnants of other books: pages torn from dictionaries, maps from atlases, lined and graph paper and even entire outer covers with spines intact. The adult reader can’t help but examine the obscured texts, wondering what they were in their original form. These authentically antique-hued backdrops are then layered with acrylic paints and pencil drawings. Even the text plays an element in this visual masterpiece, written partly in Jeffers’ own messy hand, the rest in Letraset transferred unevenly onto the page. The layered effect reminds me of Eric Carle’s tissue-paper technique. Thus, it comes as no surprise that Jeffers names “The Bad-Tempered Ladybird” (“The Grouchy Ladybug”) as one of his childhood favorites. Jeffers has also said that his work is influenced by Roald Dahl, and “The Incredible Book Eating Boy” certainly brings to mind another all-time favorite children’s book: Matilda. The main characters in both books share similar literary passions as well as unusually advanced intelligence. In addition, the appearance of Jeffers’ characters resemble those produced by Dahl’s illustrator, Quentin Blake. Although Jeffers has taken cues from some of the greatest children’s book authors, much of what he brings to “The Incredible Book Eating Boy” is one of a kind. Jeffers writes with such a fresh conversational tone, as if he were telling the story off the cuff to a young child at bedtime. The bite out of the back of this book is just one of the many eye-catching details that went into its production. 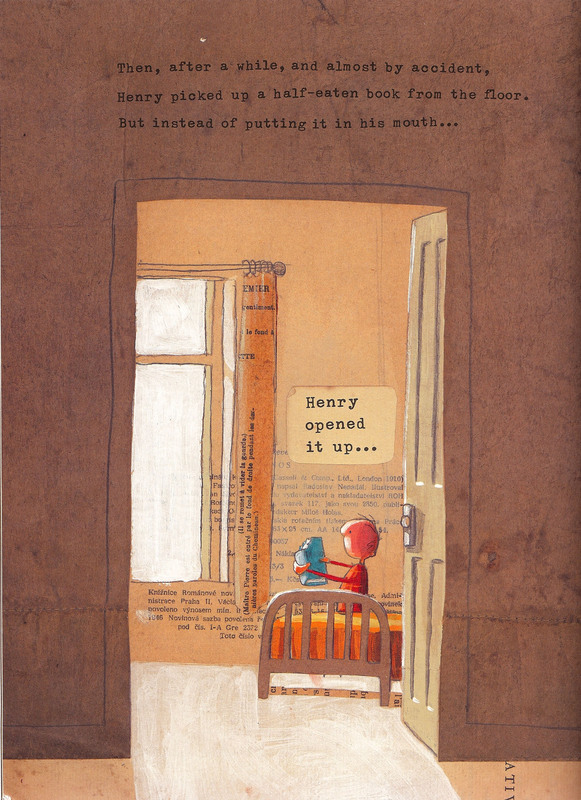 Unique illustrations are hidden under the dust jacket, and the back cover bears a humorous disclaimer for young readers who may attempt to imitate Henry’s book-eating feats. This is truly a scrumptious book to own. on September 29, 2010 at 2:00 pm | Reply yaer!